That stain on your wall may contain problems that are more than surface-deep. If you or members of your family smell mold or musty odors are suffer indoors from sneezing, sore eyes and a runny nose or nasal congestion, there’s a good chance that your home has mold contamination. 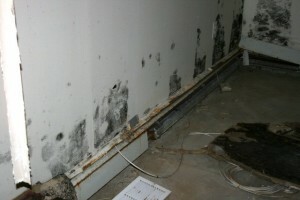 A common place for mold to grow is behind and within walls. Here are some common indicators you may have mold growing in your walls. You see it. What you may see a soot or dirt might actually be visible mold growth. Even if it’s only small a small patch of mold, you should take action immediately. If you wait, it can quickly become a bigger problem. Visible mold growth could also be a sign of a much larger infestation within the wall. Sometimes mold is not just green or black. Some mold growth appear white and thread-like or appear as clusters of small black spots. Mold comes in a variety of colors including brown, gray-green or white. Mold that grows behind wallpaper can even appear to be pink, orange or purple in color. Water and moisture problems. Leaks or moisture problems from pipe leaks, ceiling leaks or seeping water can lead to mold growth. Water stains or discoloration on your walls, floors or ceilings are often a clue that there is mold growing within or behind the material. Peeling or cracking paint or wallpaper, along with warped or bulging wall areas mean that moisture is present. Condensation on pipes or near windows creates a build up of moisture for mold to grow on. Mold may grow on the windowsills or on the wall areas surrounding the window. A large amount of condensation is a sign that you may have a humidity problem. A high humidity level can provide the water needed to feed mold and mildew. Extensive mold with your walls may require tearing down the sheet rock and the removal of insulation. If you suspect your home or business suffers from mold growth, a qualified and skilled restoration specialist is critical to fixing the problem. Specialized mold removal requires the right technology, equipment and experience to properly complete. H&H Environmental Construction and Consulting provides professional mold testing and removal services for Connecticut, Massachusetts, New York, New Jersey and Pennsylvania. Call us at 888-250-6653 if you suspect a problem anywhere in your home!